We are a family-owned business serving the greater western Washington area since 2006. Our goal is to help connect our clients with the products they love, and services they deserve. We take pride in helping our clients turn their dreams into a true reality by providing the a large variety of colors and materials to choose from. Our friendly and knowledgeable staff are available to answer any questions you may have. We look forward to serving you soon, and will strive to exceed your expectations. We can create one-of-a-kind marble and granite custom countertops of any size for residential homes and commercial properties. 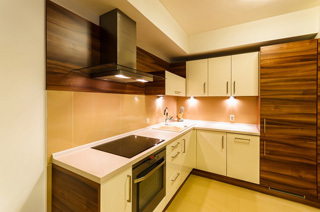 Our services as countertop fabricators include expert design and installation for kitchens, bathrooms and business remodeling projects with a variety of countertop options. As superior stone and granite fabricators, we invite you to visit 4Evergreen Fabricators to discuss your need for design, fabrication and installation of countertop materials. Whether you desire marble, granite, quartz, or environmentally friendly green countertop options and solid surface material, you have come to the right place. We are proud of our reputation in the stone fabrication and installation industry. 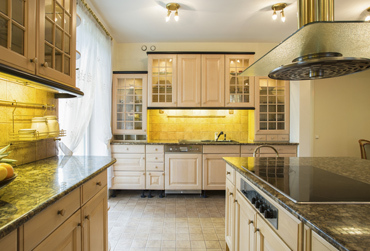 As a growing family-owned business since our founding in 2006, we are foremost in the specialty business of countertop remodels. We owe our tremendous growth over the years to our excellence in customer service, superior craftsmanship, the highest-quality materials and competitive pricing. Granite, a natural stone of stunning beauty, variations and durability has been used widely throughout the history of civilization including prehistoric structures, beautiful sculptures and an endless number of magnificent buildings. We are a family-owned and operated business founded in 2006, and known as the choice for custom fabrication and installation of granite countertops, quartz countertops, as well as other natural stone, solid surface types, and environmentally friendly green composite countertops. We custom design and fabricate countertop remodels in-house ensuring that each installation is in compliance with our high-level quality control standards. Our selection of natural stones provides a multitude of choices in addition to a broad range of color and design options. 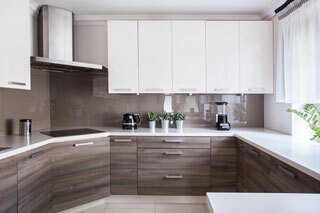 Call or visit our showroom at 4Evergreen Fabricators for recommendations and assistance in determining which of our countertop materials is best suited for your installation. If you prefer a blend of practicality, function and beauty, we highly recommend quartz countertops as an option that will meet those criteria. 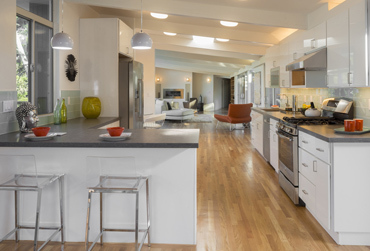 With its history as a low maintenance and highly-durable stone, quartz has become known as one of the unsung heroes of countertop materials for homeowners. 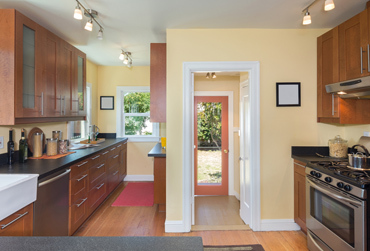 Tasteful remodeling that includes custom fabrication and a design choice of beautiful, functional countertop installations will increase value and efficiency, and provide enhanced elegance. Let us help you turn your dream into a true reality with the highest level of workmanship, quality and cost-effective custom fabrication and installation of quartz or granite countertops. 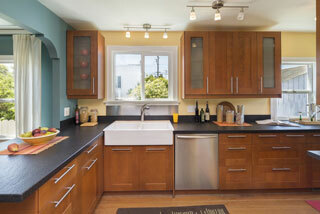 The selection of a countertop during a remodel can be confusing and difficult because there are so many great options. Each of these eco-friendly non-porous countertop materials provides an affordable, stain resistant, durable excellent alternative to solid-surface granite countertops or quartz countertops. Beautiful job. Thank you to you and your team for working with me. Edgar and Nathan were great letting me find the best angle for all the crystals in that granite. Edgar even put me on the forklift so I could look down on the waterfall from the direction I thought had the most pop. Otherwise I was only seeing it from what would be the floor looking up. What good would that be? I really enjoyed working with your team. Have a great vacation in HI! Wow, thanks so much for doing such a great job on the countertops. They are beautiful! I also very much appreciate that you took the time to carefully level all the kitchen cabinets and dishwasher. The higher backsplash looks great behind the stove and around the room (really elegant), the outlet in the backsplash looks like it belongs there. The seam appears to be perfect, and you are right, small water puddles stay where they are dropped and don't travel. We'll figure out how to patch the little gap at the end wall across from the fridge. This kitchen counter will really improve the quality of our lives. The bar countertop also looks great, the shape seems to have come out just right, and I am thrilled that you found a way to suspend it without a leg. We'll figure out a way to minimize the little bit of support board visible at one end. At a minimum, paint will help--it might also be possible to bevel the end of the board? The upstairs bath, main floor bath and the basement laundry room all look great too. Everything looks clean and modern and very professional. Travis and Jacob arrived at our place on Vashon Island at 10 AM, countertops already cut roughly to size. They proceeded to install them, very carefully, very knowledgeably, very beautifully, in our kitchen and bathroom. And all with good spirit. light hearts, and good will. The seams are essentially invisible, the edges slightly rounded, the sinks perfectly centered and secure. They worked and worked —cutting, sanding, buffing, polishing, then installing countertops, backsplashes, holes for faucet fixtures, and then more buffing — until everything was installed... at 7 PM. Everything was sparkling and gleaming. We couldn’t be happier with their work, or more thrilled with the final results. We would recommend them without hesitation. If you want it done professionally, if you want it done when they say they’ll do it, if you want to have a kitchen that looks even better than you had imagined, hire them. Thank you for the great job!! I would gladly refer your company as I was pleased and impressed with the entire process.Thank you!